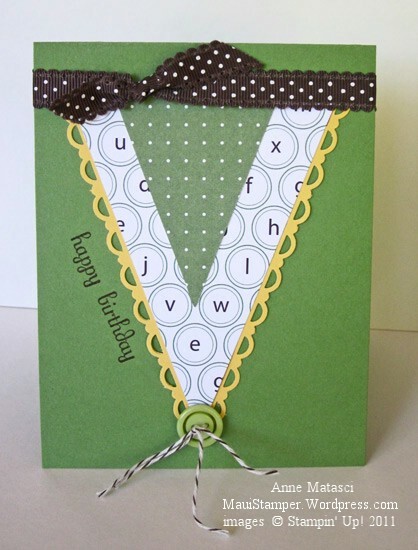 I was going for a pennant effect here, but every time I look at this card I see a shirt front. Must be that button. Shirt front, pennant, whatever – they both have a masculine feel. I’m always running short of masculine cards. I mean, face it – cards with flowers and butterflies and sparkly jewels are lots of fun! Cards with motors and tools and shirt fronts are…fun too, but it’s not the same type of fun. I may have to impose a Manly Card Quota on myself. Hmm. Check back with me on that one.